To argue that case, it compared the penetration of Apple TV among Apple's customers. The firm noted that just over one in five of the "Apple product buyers" it surveyed own an Apple TV, roughly in line with the adoption of Amazon's Fire TV and Roku. It noted that Apple TV was significantly more popular than Google ChromeCast or Tivo among these users. 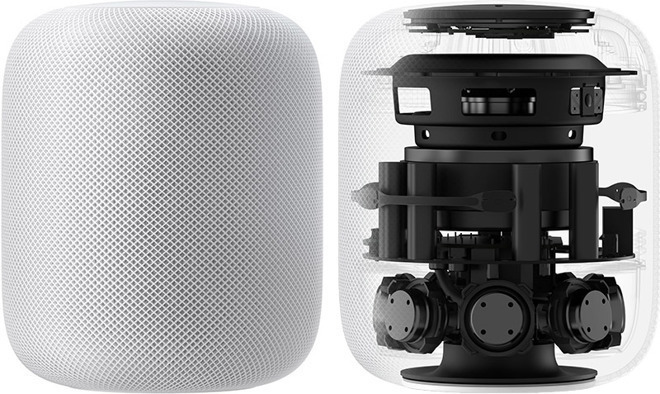 However, "only 2 percent of Apple customers have a HomePod as of the June 2018 quarter, with Amazon Echo and Google Home having far greater shares," the firm noted, without detailing the size of that population. The firm suggests that the reason Apple TV has achieved a competitive position next to other TV devices is that its price tag is closer to the other TV devices—in contrast to HomePod, which it implies has a higher price differential compared to Amazon's cheapest Echo modules. That's because Apple already includes Siri-based microphone functionality on its iPhones, iPads, Apple Watches, AirPods and Macs it sells, for free, as well as in HandsFree and CarPlay compatible vehicles. And this year, Apple will be selling HomePods next to some compelling products: Apple Watch Series 4, its flashy new iPhone XS and XR models, what appears to be a new set of iPods, and potentially a new revision of AirPods. Apple is also issuing another update﻿ to enhance HomePod features. Note that Amazon's Alexa launched around the same time that Apple introduced Apple Watch. Both products have ardent fans, and an installed base of around 40-50 million units. But consider the difference between what they achieved for the company that launched them.